2017 Top 50 True Freshman LB’s and their Impact on the season. Today we move on to my 2017 Top 50 True Freshman Linebackers and their impact on the season. Georgia dominated on this list with 3 of 5 players having contributed followed by Alabama with 2 out of 4. 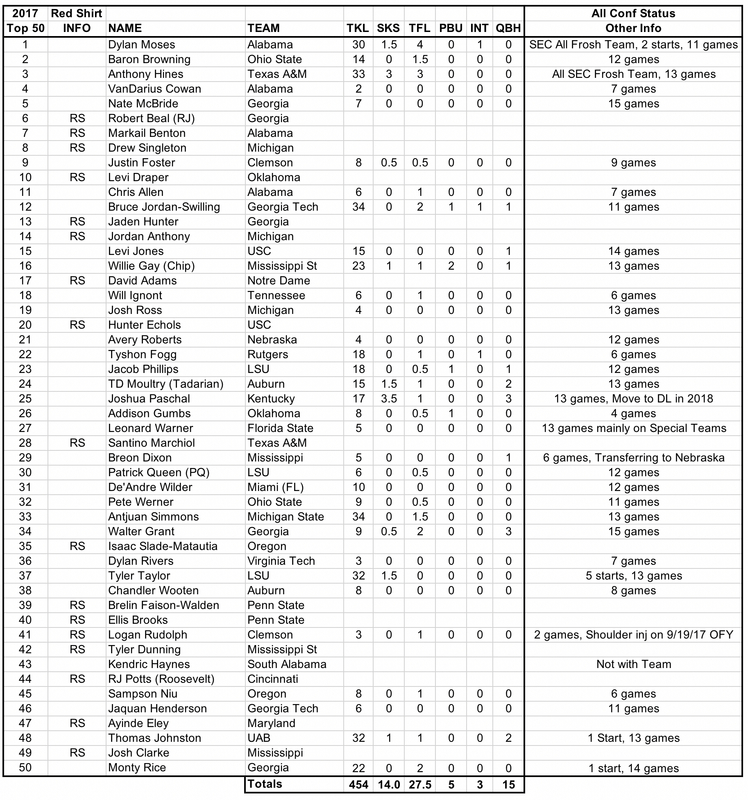 Out of the Top 50 true freshman on this list, 33 (66%) contributed in some way this past season. Of the 33 players with stats, only 6 were from my Top 10. The top 6 players on the list each had over 30 tackles, then you start to see the drop off in production. Two freshman PS#12 Bruce Jordan-Swilling of Georgia Tech and PS#33 Antjuan Simmons of Michigan St led the group each with 34 tackles. PS# 3 Texas A&M’s Anthony Hines came in a close 2nd with 33 tackles followed by Tyler Taylor (PS#37) of LSU and Thomas Johnston (PS#48) of UAB both with 32. The sacks leader this past year was PS#25 Josh Paschal from Kentucky with 3.5 with Anthony Hines close behind with 3. Only 3 players came away with a interception on this list. The 2017 Top 50 True Freshman Linebackers totaled 454 tackles, 14.0 sacks and 27.5 tackles for loss. Here is the complete list of my 2017 Top 50 True Freshman Linebackers. On Monday we release the final position of the 2017 Top 50 true freshman with the DB’s. Top 50 true freshman LB’s for 2018.